A reminder of this event from the SF Kiwis – New Zealand American Association San Francisco organization. On behalf of the New Zealand and Australian communities in San Francisco, it is our honour to invite you to attend the annual ANZAC Day service to be held at the Log Cabin, 1299 Storey Ave, in San Francisco on Sunday the 28th of April. Following the ceremony at the Log Cabin, there will be a BBQ with light refreshments and a no host bar. Please purchase your BBQ tickets to assist with catering. BBQ tickets can be purchased from the SF Aussies website at this link, or possibly on the day of for $25 per person & $15 per child (depending if they sell out via the website or not). 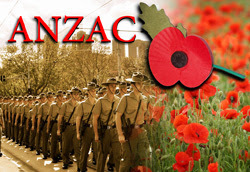 This entry was posted in ANZAC Day and tagged ANZAC Day on March 25, 2019 by Michael K. Barbour.